Posted on Wed, Feb 29, 2012 : 1:42 p.m. The financial task force is recommending higher fares for express services, including distance-based zone fares with a surcharge for services that cross county lines. 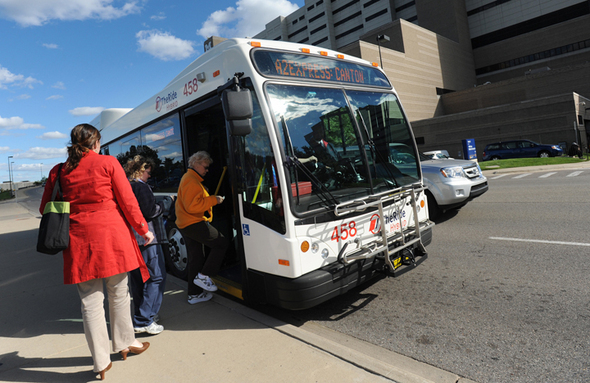 A financial task force helping the Ann Arbor Transportation Authority with its plans for a countywide transit expansion released a long-awaited funding report Wednesday. The report contemplates — without recommending — a 0.5-mill countywide transit millage to help fund the AATA's vision for expanding transit services throughout the county. The task force, formed last fall, is co-chaired by former Washtenaw County Administrator Bob Guenzel and Albert Berriz, CEO of McKinley Inc., an Ann Arbor-based real estate firm. While the task force has found a five-year transit program can be realistically funded with a 0.5-mill levy, Guenzel said, it's prudent to wait to make a final recommendation until it's known if recently introduced state legislation offers a better alternative. Big talks are happening around transit at the state level and Gov. Rick Snyder is calling for creation of a regional transit authority for Southeast Michigan. The task force is recommending the AATA wait and see how some of that plays out in the coming months. Guenzel and Berriz said they hope the task force remains active and will reconvene at the appropriate time to evaluate whether to move forward with a millage recommendation. "I would prefer that we call this not final, but just on hold for now," Berriz said at Wednesday's meeting of the task force. "I don't think we can arrive at any conclusions today." For the past few years, the discussions about expanding transit services in Washtenaw County contemplated layering a 1-mill countywide tax on top of Ann Arbor's existing 2 mills, so the 0.5-mill levy mentioned in today's report is half the tax that's been discussed. Both Ann Arbor and Ypsilanti would continue to levy their current transit millages in addition to the new half-mill tax. The reduced millage rate came from work done by a subgroup of the task force that worked out a refined budget scenario and service plan. The new five-year budget model endorsed by the financial task force Wednesday estimates $161.5 million in operating expenses and $141.4 million in operating revenues, in addition to $56.1 million in capital costs and $41.3 million in operating revenues. The task force report is worded as such that it "endorses the findings and recommendations of the services review subgroup as a guide for further development of the five-year transit program," but it recommends a final funding recommendation be deferred. When the subgroup began working on a five-year transit program budget, there was a $60.8 million gap between estimated funding and capital and operating costs. The budget now shows a total gap of $32.9 million, which the task force report suggests could be made up with the 0.5-mill countywide tax. That would equal $50 a year for a property with a taxable value of $100,000 or a market value of $200,000. Norman Herbert, retired treasurer for the University of Michigan and a member of the financial task force, gave a report on the subgroup's recommendations Wednesday. Herbert said the millage is included as simply a "placeholder or proxy" to measure the impacts of altering services, reducing costs and increasing revenues as talks continue. "It is by no means the suggested model for funding going forward," he said. "There are too many unanswered questions that the subgroup couldn't address in full. And so we don't want this millage to be viewed as the solution. It's not the solution necessarily." The task force recognized the subgroup's recommendations for a five-year service program, including ongoing bus replacements, urban bus network enhancements, countywide door-to-door and flex services, express bus services, local community circulators and local transit hubs, park-and-ride lots, car and vanpool services, creation of so-called "superstops" along Washtenaw Avenue and bus-related support facilities. The subgroup also recommended an average fare increase of 50 cents for fixed-route bus service to reduce the level of local subsidy, as well as fare increases for door-to-door paratransit services. It recommends higher fares for express services, including distance-based zone fares with a surcharge for services that cross county lines. The subgroup recommended removing several capital-intensive projects from the five-year service plan, including a north-south high-capacity connector service, Washtenaw Avenue high-capacity service, and east-west and north-south commuter rail projects. The group says those should be considered separately from the five-year service plan since they're longer range in nature and likely will rely heavily on federal and possibly private funding. Another recommendation is that the Ann Arbor downtown circulator be a discretionary project funded only if private dollars can be identified. The analysis of the subgroup assumed that all governmental entities in the county would be a part of the tax base for purposes of calculating millage revenues. But communities will have the chance to opt out and a handful of townships already have declined to be involved. Berriz said there are two choices to close the current funding gap: Either a countywide millage or funding via the methodology that arises as a result of the governor's transit plan. "As the facts gel in the next coming months and weeks, and whatever the case may be, we can come back and make some better assumptions and fit them into the model and decide what that really means," Berriz said. AATA CEO Michael Ford said the task force recommendations will go to the AATA board for consideration. "Speaking on behalf of the business community, we all got involved because we think that transportation is a critical factor in serving this community and serving the work force that works in the hospitals, that works in the office buildings, that works in all of the places that we have." 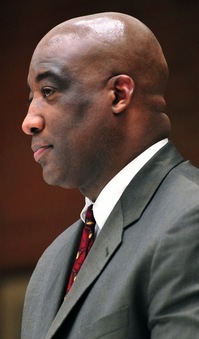 Task force member Conan Smith, chairman of the Washtenaw County Board of Commissioners, said he was worried what recommendations might come back from the subgroup, but he applauded the plan released Wednesday. "I think you've really identified, in terms of service reductions, really key things that can be picked up by other entities," he told members of the subgroup. "We ought to have some regional transit priorities that can be sent to that group if it passes so that we can say, 'Use Washtenaw's portion of the funding do this.' I was very pleased with the prioritization." Added Smith: "I'd still love to see it all come out, and maybe if we're rich we'll be able to do it all, but the core services are captured in here." Smith expressed some concern about the possibility of fare increases, saying the AATA should make sure it keeps fares low and access to services high. "We're talking about a not-insignificant increase in their individual costs if they are dependent upon transit," Smith said. AATA CEO Michael Ford said the task force recommendations will go to the AATA board for consideration, as well as an unincorporated countywide transit authority board. Jim Kosteva, director of community relations for the University of Michigan and a member of the task force, said he hopes to see the task force reconvene later this year. "Yes, we can be somewhat patient, but in that interest that we all share as businesses and employers across the community, we want to move ahead with expanded opportunities for providing greater transit in the community," he said. "So I hope we would reconvene no later than next January, and obviously sooner if we get some greater clarity regarding the opportunities and options that might be afforded us." AATA Chairman Jesse Bernstein called the task force's report "the bedrock of how we move forward" on the countywide expansion plan. "We're going to be dealing with all of those intricacies of setting fares, determining routes, but this has been an incredibly helpful product," he said. Bernstein said the actual method of funding won't be determined until AATA officials know what the state is doing. AATA officials remain hopeful the Ann Arbor City Council will approve a four-party agreement that lays the framework for creation of a new countywide transit authority on March 5. "Hopefully the city will approve the agreement, and then that's the framework to figure out how we fund it and when we go about doing that," Bernstein said. While talks play out at the state level, Bernstein said, the AATA will do what it can within its resources to move toward the countywide vision. Asked when a new countywide authority realistically might be incorporated, he replied: "When we're ready." Bernstein said it's highly unlikely that county voters will see a countywide transit millage proposal appear on the ballot anytime in 2012. "As far as I'm concerned, I don't see it happening this year," he said. "The politics are such that you want this millage in a four-year election cycle, but that to me is not the determinant. If this doesn't pass because it's the right thing to do, then it doesn't matter when the election is." Mon, Mar 5, 2012 : 4:51 a.m.
Bad plan, poor vision, lacking expertise, and definitive strategy. Too much ambiguity in management. Thu, Mar 1, 2012 : 8:01 p.m.
Yep - More taxes solves everything! Thu, Mar 1, 2012 : 6:32 p.m.
Thu, Mar 1, 2012 : 4:01 p.m.
Another unneeded uncontollable empire being move forward from the centroid of failed politicians. Thu, Mar 1, 2012 : 1:02 p.m.
No more new taxes. If you want to tax something then UNTAX something else. Thu, Mar 1, 2012 : 1:53 p.m. Thank you, this is my new battle cry! Thu, Mar 1, 2012 : 12:29 p.m.
To clarify, the Financial Task Force's recommendation is just that - a recommendation. This body has no authority to make any decisions but has simply presented a hypothetical case of how the finances of an expanded system would work out. The AATA board can make plans and even put some of the processes in place (they have already spent Ann Arbor tax money on commuter express buses to Chelsea and Canton, for example) but also has no authority over what tax will be levied or what services offered by the new authority. Or on the fares that the new authority will impose. Once the Act 196 authority is created (which will take action by the County Board of Commissioners), it will in essence be an independent governmental entity which will have a broad scope of powers. The current AATA board expects to be included in that board but will be only 7 of 15 members, so will not have a majority stake. They may have some surprises ahead of them. Act 196, under which the new &quot;countywide&quot; authority would be formed, is here: <a href="http://tinyurl.com/7uxg8u7" rel='nofollow'>http://tinyurl.com/7uxg8u7</a> It reads in party: AN ACT ... to authorize certain local entities to levy property taxes for public transportation service and public transportation purposes; ... to provide for the issuance of bonds and notes; to provide for the pledge of taxes, revenues, assessments, tax levies, and other funds for bond or note payment; ... to provide for transfer of certain tax revenue and certain powers, rights, duties, and obligations; to authorize condemnation proceedings; ... and to prescribe penalties and provide remedies. Thu, Mar 1, 2012 : 11:56 a.m.
Jim Kosteva of UofM - &quot;&quot;Yes, we can be somewhat patient, but in that interest that we all share as businesses and employers across the community, we want to move ahead with expanded opportunities for providing greater transit in the community,&quot; he said.&quot; Translation: We want the AA and county taxpayers to further subsidize transportation costs for our employees, and we want it SOON. Thu, Mar 1, 2012 : 7:54 a.m.
Man if I lived in Ann Arbor I'd have to take the bus because all my gas money would be going to taxes. Thu, Mar 1, 2012 : 4 a.m.
Got a couple reasons to oppose this.First, I, nor anybody in my taxpaying household has ridden a bus in years. Second, the bus stops right outside my sub on the main roads have litter scatterred all around them, no trash cans for these riders so they just litter right there. Third, I see countless busses going down the road at less than 10% capacity. Fourth, they stopped painting the buses purple. Thu, Mar 1, 2012 : 3:11 a.m. If local business and UM medical are staunch supporters, how can they find a way to close the funding gap without adding to A2 homeowners' tax burdens. Consider who contends that this is a &quot;value added&quot; proposition and look for those entities for funding. A2 homeowners will not be at the top of that list. Buses, buses and more buses......even the $1.2 million dollar type that run on fuel gimmicks and are good for little more then a laugh. When it comes to mass transit, the state of Michigan can hardly be more pathetic. This is the wrong direction, as is Bus Rapid Transit. Those who think BRT will provide the economic benefits of permanent rail are mistaken. What has been proposed is just like the film incentive disaster - another short term gimmick that will be abandoned by the next administration that rolls into Lansing. Those who say there is no political support for more buses are right - but there would be plenty of support for a system that makes sense to voters. Michigan is virtually alone in the nation for our absolute inability to think, plan or build for the long term benefit of this state. Can anyone imagine trying to built the Mackinac Bridge today!? Do we have people in leadership positions who know how to finance large projects?? The only mass transit system that will make a meaningful impact on Michigan's economy is a $3-5 billion dollar light or rapid rail system linking Metro Airport to southeast Michigan - everything else is bs, noise and nonsense. Wed, Feb 29, 2012 : 11:50 p.m.
Or it could be funded by rate increases. Right now, riders pay 10 percent of the actual cost to run AATA. How about making it 25. And how about being more efficient with bus purchases. Wed, Feb 29, 2012 : 10:16 p.m.
NO, NO, NO. No more taxes on the property owner. It is not just the responsibility of the property owner. Everyone with an income should be paying for this. If this is such a great idea have the user pay the extra cost. Notice folks that the system is not self supporting. I wonder how much less fuel would be used on smaller buses cutting the fuel costs. Never are the buses half full on average. Why should the property owner be the one paying for a system that hardly pays for itself. Not only does it use property taxes but also Federal grants that I also pay for. NO, NO, NO and NO MORE. It could also be funded by having public officials and transit advocates with too much time on their hands scouring Washtenaw County for abandoned pop bottles. Wed, Feb 29, 2012 : 9:14 p.m. I live in AA, 2 mils is enough. The only way I vote for this is if the 2 mils drop to .5 mil. the same as everyone else. Wed, Feb 29, 2012 : 9:02 p.m. The Average Taxpayer pays only $250.00 for AATA? I do not ride the bus so why should I pay for U of M Hospital or other downtown employees to get to work? And now they want us to pay more? Why not raise fees on the people who use the AATA? or reduce some AATA departments to cover the expansion? Wed, Feb 29, 2012 : 8:42 p.m.
We taxpayers cannot afford more taxes! Beware politicans - Vote for any additional taxes and WE WILL VOTE YOU OUT! More Taxes, More Taxes, More Taxes...Taxes for AATA, Taxes For new technology we will be told is worn out before we're finished paying for it. Wed, Feb 29, 2012 : 8:14 p.m. The average homeowner in Ann Arbor is already paying about $250/year for AATA. The additional 1/2 mil should only be on those not already contributing to the regional bus system; as long as the system truly becomes county wide. The bus is a current bargain to it's riders, of which I am one. The proposed 50 cent increase is still quite the bargain. Ypsilanti is also paying as well. So let us not forget that we use this service as well. Ann Arbor might pay more because there is a bigger area to cover then there is for Ypsilanti. Although I still want a shuttle to Whittaker Library. Wed, Feb 29, 2012 : 9:04 p.m.
At the very least a &quot;Thank You&quot; note to me would be appreciated for subsidizing your bus ride. Wed, Feb 29, 2012 : 8:10 p.m.
Thu, Mar 1, 2012 : 2:48 a.m.
Ann Arbor is complaining about having to pay in taxes for something some of you don't use. So what if it is given to someone else, at least Ann Arbor denizens do not have to pay for it. Duh!! We use bus service all the time. We need it where we live because of rising gas prices. Much cheaper to ride then to drive. Wed, Feb 29, 2012 : 8:15 p.m. Wed, Feb 29, 2012 : 7:26 p.m.
Commuter rail was also recommended to be removed from the five year plan. Another reason to further question the millions being spent on Fuller Station. Wed, Feb 29, 2012 : 7:19 p.m. The last sentence of the Financial Task Force's full report hits the nail on the head: &quot; 4.) Agrees to put the Task Force &quot;on hold&quot;, to be convened at a later date when further information is available.&quot; All the &quot;issues of concern&quot; reported by the task force (future levels of state funding, federal funding, the new RTA and other incomplete assumptions) will not be resolved anytime soon. Without these key financial pieces of the puzzle the city council should follow the task forces lead and put the Four Party Agreement &quot; on hold&quot;, to be convened at a later date when further information is available.